In 1669, Niels Stensen (1638-1686), better known then and now by his Latinized name Nicolaus Steno, formulated a few basic rules that helped him make sense of the rocks of Tuscany and the various objects contained within them. His short preliminary work, De Solido Intra Solidum Naturaliter Contento — Dissertationis Prodromus (Provisional report on solid bodies naturally embedded in other solids), included several propositions that have since become fundamental to geologists studying all kinds of rocks. Three of these are known as Steno's principles, and a fourth observation, on crystals, is known as Steno's Law. The quotes given here are from the English translation of 1916. "At the time when any given stratum was being formed, all the matter resting upon it was fluid, and, therefore, at the time when the lower stratum was being formed, none of the upper strata existed." Today we restrict this principle to sedimentary rocks, which were understood differently in Steno's time. Basically, he deduced that rocks were laid down in vertical order just as sediments are laid down today, under water, with new on top of old. This principle allows us to piece together the succession of fossil life that defines much of the geologic time scale. "...strata either perpendicular to the horizon or inclined to it, were at one time parallel to the horizon." Steno reasoned that strongly tilted rocks did not start that way, but were affected by later events—either upheaval by volcanic disturbances or collapse from beneath by cave-ins. Today we know that some strata start out tilted, but nevertheless this principle enables us to easily detect unnatural degrees of tilt and infer that they have been disturbed since their formation. And we know of many more causes, from tectonics to intrusions, that can tilt and fold rocks. "Materials forming any stratum were continuous over the surface of the Earth unless some other solid bodies stood in the way." This principle allowed Steno to link identical rocks on opposite sides of a river valley and deduce the history of events (mostly erosion) that separated them. Today we apply this principle across the Grand Canyon—even across oceans to link continents that once were adjoined. "If a body or discontinuity cuts across a stratum, it must have formed after that stratum." This principle is essential in studying all kinds of rocks, not just sedimentary ones. With it we can untangle intricate sequences of geologic events such as faulting, folding, deformation, and emplacement of dikes and veins. ". . . in the plane of the [crystal] axis both the number and the length of the sides are changed in various ways without changing the angles." The other principles are often called Steno's Laws, but this one stands alone at the foundation of crystallography. It explains just what it is about mineral crystals that make them distinct and identifiable even when their overall shapes may differ—the angles between their faces. It gave Steno a reliable, geometrical means of distinguishing minerals from each other as well as from rock clasts, ​fossils and other "solids embedded in solids." "If a solid body is enclosed on all sides by another solid body, of the two bodies that one first became hard which, in the mutual contact, expresses on its own surface the properties of the other surface." (This may be clearer if we change "expresses" to "impresses" and switch "own" with "other.") While the "official" Principles pertain to layers of rock and their shapes and orientations, Steno's own principles were strictly about "solids within solids." Which of two things came first? The one that was not restricted by the other. Thus he could confidently state that fossil shells existed before the rock that enclosed them. And we, for example, can see that the stones in a conglomerate are older than the matrix that encloses them. "If a solid substance is in every other way like another solid substance, not only as regards the conditions of surface, but also as regards the inner arrangement of parts and particles, it will also be like it as regards the manner and place of production... "
Today we might say, "If it walks like a duck and quacks like a duck, it is a duck." In Steno's day a long-running argument centered around fossil shark's teeth, known as glossopetrae: were they growths that arose inside rocks, remains of once-living things, or just weird things put there by God to challenge us? Steno's answer was straightforward. "If a solid body has been produced according to the laws of nature, it has been produced from a fluid." 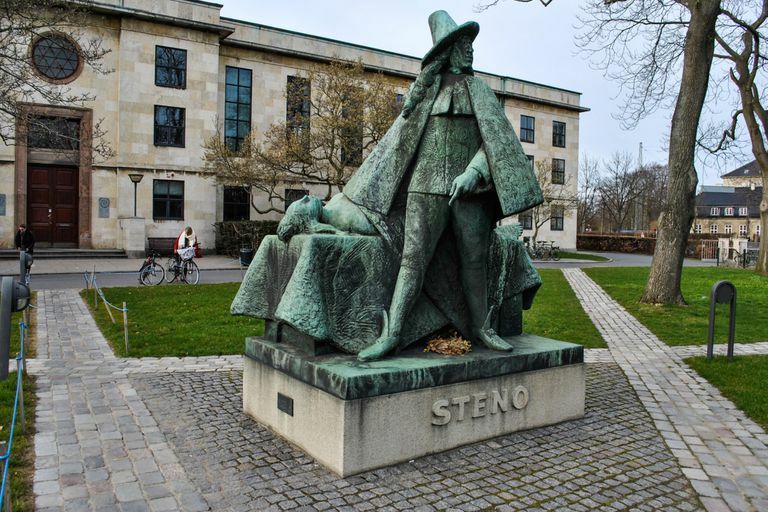 Steno was speaking very generally here, and he went on to discuss the growth of animals and plants as well as minerals, drawing on his deep knowledge of anatomy. But in the case of minerals, he could assert that crystals accrete from outside rather than grow from inside. This is a profound observation that has ongoing applications for igneous and metamorphic rocks, not just the sedimentary rocks of Tuscany.